The risk remains !! – No reversal signs yet. Stock Pickers Market. 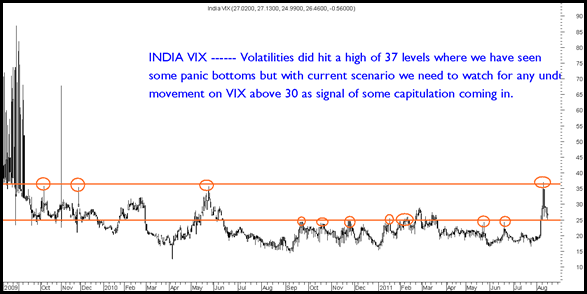 movement on VIX above 30 as signal of some capitulation coming in. SENSEX ---- Breakdown below 17300 confirmed but follow up action not seen yet. 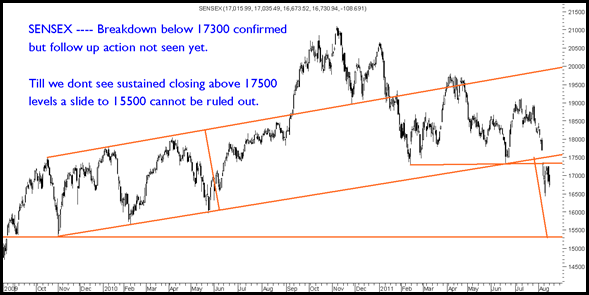 Till we dont see sustained closing above 17500 levels a slide to 15500 cannot be ruled out. Although the broader market looks very exciting investors should avoid leverage and buy slowly only. As of now the view is to keep at least 30-50% cash. We did advise some buying in stocks in previous week at an index level of 4950-5000 and the next buying zone would be closer to 4700 with a long term view. 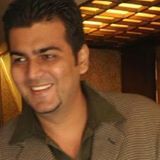 Traders should remain nimble as in current scenario any undue announcement can lead to huge volatility. The next few months will be an interesting opportunity for long term investors but it will be a stock pickers market and test patience. One of my favorites remain Godrej Inds with a long term view and one can SIP into the stock. Sensex/Nifty touched 200 dma and recent lows of 7730. Interesting Signal ! #Sensex to touch 1,50,000 and Nifty 1,30,000 or 1,00,000 by 2030. Extrapolation ! !